It only takes one sheet of paper with sensitive information for an identity thief to busily start setting up false accounts in your name, created the need for every home and business to shred.There are countless ways to shred paper. 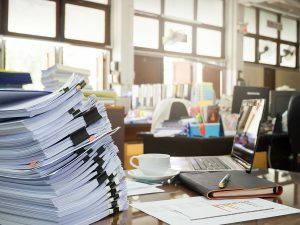 You could always tear up a page or two, but that might not scale to a stack of mail and paperwork that accumulates over time. For this volume you should consider renting a shredder.There are a few things to take into account when choosing a paper shredder. Make sure it is a micro-cut or cross-cut shredder. Strip shredders don’t provide enough security since it is so easy to reassemble the pages.The shredder should be large enough to handle several pages at a time. You will want one that can shred junk mail without requiring you to take it apart. Never opt for the cheap ones that fit on the top of a trash can. You will be replacing it in no time and end up spending more than just buying a good one.Shredders work fine for incoming junk mail but aren’t a great solution for end of year and tax time cleaning. When you have a couple of drawers full it is time for something more.At that point, it makes sense to use services like Ship ‘n’ Shred. They offer shredding priced by the box and makes the shredding convenient with the option for pickup at your home or office. Like Ship N’ Shred, there are also drop off shredding locations at UPS and other packaging stores where you can drop off your boxes and pay per pound.Since businesses have a larger volume of paper to shred, a professional shredding service is then the most cost-effective solution. Professional shredders have industrial equipment to shred by the trash bin full. Larger equipment allows for economies of scale to reduce the price per pound.Professional shredding services offer on-site or off-site shredding. On-site shredding is when the shredding is done at your location using specialized trucks. With off-site shredding the documents are picked up and shredded at their secure shredding facility.Both methods offer certificates of destruction and are compliant with federal and state privacy laws such as HIPAA and FACTA.Choosing the better service over the other is based on your shredding project needs. In terms of cost, shredding between 100–300 lbs will make mobile shredding the cheaper option, but if you’re shredding 300 lbs or more, offsite shredding becomes most cost-efficient.The other factor to consider is security. While you receive a certificate of destruction with both services, an on-site shredding service may be ideal, as it lets you to witness the shredding when you are either legally required or prefer the extra assurance. Shred Nations can help you figure out the service that best suits your shredding project. We offer mobile shredding services, drop off shredding, and Ship N’ Shred as ways to dispose of your personal documents securely, quickly, and efficiently.Call Shred Nations at (800) 747-3365 or fill out the form to the right to get free, no-obligation quotes from shredding service providers in your area that will work with you to make sure your documents are shredded securely.